Corian® Quartz was created for a lifetime of easy care. Just follow our simple guidelines to help you keep your Corian® Quartz looking beautiful. Learning how to care for your Corian® Quartz (formerly Zodiaq® quartz) takes no time at all—thanks to the stain-resistance of this remarkable material. Corian® Quartz is a tough, nonporous, chemically-resistant, high-performance surface that elevates your design with the natural beauty of quartz. 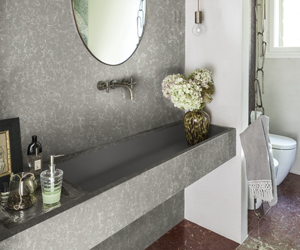 With simple care, Corian® Quartz will retain its radiant, lustrous appearance for many years. For routine cleaning, simply wipe down your countertop with a damp cloth or paper towel and, if necessary, a small amount of non-bleach, non-abrasive cleanser. Even though Corian® Quartz resists permanent staining when exposed to liquids (such as wine, vinegar, tea, lemon juice and soda) or fruits and vegetables, you’ll want to wipe up food and liquid spills as soon as possible. or a comparable cleaning product. Cutting Boards and Trivets - Corian® Quartz are heat- and scratch-resistant, but not heat- and scratch-proof. Use trivets or pads with hot pots and always use a cutting board. Never chop or slice food directly on your countertops. If any of the substances mentioned below come into contact with your Corian® Quartz, rinse the exposed surface immediately and thoroughly with water. No Wax or Polish Necessary - Because it is nonporous, Corian® Quartz does not require sealants or waxes. Corian® Quartz keeps its lustrous gloss and ultra-smooth surface without polishing or applying sealant. Do Not Use Bleach - Avoid using cleaners that contain bleach. Always follow the cleaner manufacturer’s use instructions and exercise proper care when handling and storing any cleaning products. Avoid High-pH Cleaners - Casual exposure to alkaline solutions, such as diluted bleach, will not damage Corian® Quartz. Highly alkaline (high pH) cleaners, such as oven cleaners and concentrated bleach, are not recommended. *, or a comparable degreasing product, to help loosen and remove the grease from the surface. Follow the cleaner manufacturer’s instructions for use. , or a comparable product, and rub it into the stain. Rinse thoroughly with warm water to remove any cleaner residue. Keep Solvents and Powerful Chemicals Off the Counter - Avoid exposing Corian® Quartz to strong chemicals and solvents, especially paint removers or furniture strippers containing trichlorethane or methylene chloride. Keep nail polish remover, bleach, detergent, permanent markers or inks, and oil soaps away from your Corian® Quartz. Heat Damage Prevention - To maintain the beauty of Corian® Quartz, do not place hot skillets or roasting pans directly onto the surface. We recommend the use of trivets and hot pads. Dealing with More Difficult Spills and Materials - Materials that harden as they dry (such as gum, food, grease, nail polish or paint) are especially tenacious. Remove these by gently scraping away the excess with a plastic putty knife. Whatever happens, do not despair! In the unlikely event that you do experience any problems due to a manufacturer’s defect, you can rest assured that DuPont backs its Corian® Quartz with a ten-year limited residential warranty. For customer inquiries, call: 1-800-426-7426. * Scotch-Brite® is a registered trademark of the 3M Company. Formula 409® Glass & Surface Cleaner is a registered trademark of the Clorox Company. * Greased Lightning™ is a registered trademark of the Chemtura Corporation. Goo Gone® is a registered trademark of Goo Gone®.